MADISON, Wis. Wisconsin is going retro for the Rose Bowl. 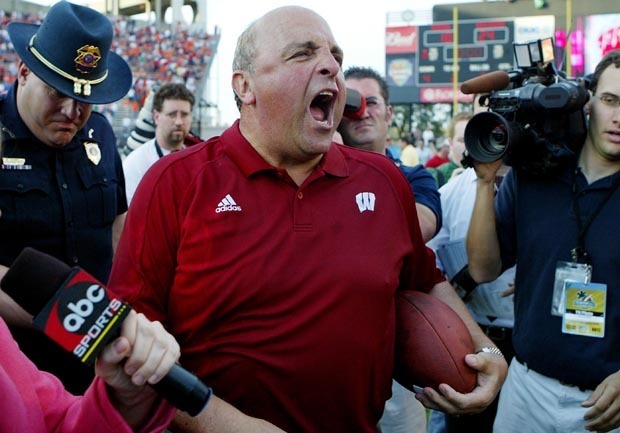 Former coach Barry Alvarez will return to the sidelines to coach the Badgers when they face No. 8 Stanford on New Year's Day. The announcement Thursday came two days after Bret Bielema stepped down to take over at Arkansas. "I'm very excited about coming back," Alvarez said. "This will be a one-game  I'm not looking to do it any longer than one game." Bielema's departure was a shock, coming just three days after Wisconsin earned a school-record third straight trip to the Rose Bowl with a 70-31 rout of then-No. 14 Nebraska in the Big Ten championship. But speculation immediately centered on Alvarez returning as coach, at least for one game. His return will mean little disruption for players, and even fewer distractions. Though Alvarez stepped down as head coach following the 2005 season, he's remained an integral part of the football program as Wisconsin's athletic director and players are familiar and comfortable with him. They won't have to adapt to a new coaching style  Alvarez hand-picked Bielema as his successor  and Alvarez won't have the pressure of a one-game audition that a current assistant looking to upgrade his job or keep the one he's got would. In fact, it was the players who convinced Alvarez to come back. Following Bielema's announcement, Alvarez received messages from senior quarterback Curt Phillips and captain Mike Taylor, who said the players had met and decided they wanted him as their Rose Bowl coach. "I told him I would be honored to coach them," Alvarez said. "I wanted them to understand, if I was going to coach them, we weren't going to screw around, We were going to go out there to win." Alvarez's 118-73-4 record in 16 seasons coaching the Badgers includes a 3-0 mark in the Rose Bowls  Wisconsin's only victories in eight trips to Pasadena. The chance to see Alvarez on the sidelines one more time is sure to entice some alums and boosters into making trips to the Rose Bowl, too. Wisconsin supporters will always appreciate Alvarez, who took a program that was little more than a laughing stock for three decades and turned it into one of the Big Ten's top teams. Wisconsin had had five straight losing seasons before Alvarez arrived in 1990, and posted a winning record in just six of the previous 26 seasons. After losing to USC in the 1963 Rose Bowl, Wisconsin would go 19 years without a bowl appearance. The Badgers were in such sorry shape that the Wisconsin band's postgame show was the main attraction at Camp Randall, with students not even bothering to show up until halftime or later. But under Alvarez, Wisconsin became known for big, stingy defenses, a power running game and a massive offense line that would soon be imitated throughout college and the pros. The Badgers had a Big Ten-record 10 straight seasons with a 1,000-yard rusher under Alvarez, and Ron Dayne became the school's second Heisman Trophy winner in 1999. Four years after taking over, Alvarez led the Badgers to a 10-1-1 record, a No. 4 ranking and the 1994 Rose Bowl. Wisconsin has had only two losing seasons since then. Alvarez's return also gives the Badgers something to talk about besides their less-than-impressive record. Wisconsin is headed for the Rose Bowl at 8-5, and more than a few people have said the Badgers aren't worthy of a spot in a BCS bowl. Wisconsin was just third in the Big Ten's Leaders Division. But neither Ohio State nor Penn State was eligible for the postseason because of NCAA sanctions, sending the Badgers to the Big Ten title game by default.